Ms. Fitz had had it with Boy Wonder. He would always come in 8th period on Friday when there was a school football game or something and write her up because there weren't enough students there. 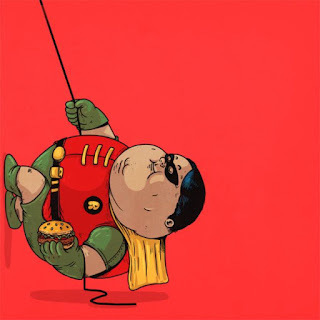 In fact, everyone had had it with Boy Wonder. The problem was, no one would say anything. Boy Wonder decided one morning that history would now be taught by topic rather than chronologically. Every single teacher hated the idea, but no one knew what to do. Chapter leader said file a Professional Conciliation Complaint under Article 24. He said he'd co-sign it if they wanted, but someone would have to sign it who taught the courses. This was a tough thing to do. After all, there is no wrath quite like the wrath of a wounded Boy Wonder. Anyone who signed it was going to be observed each and every day and rated ineffective in everything no matter what. There had to be a solution. But what was it? Ms. Fitz had a bottle of Thorazine at home from when she'd cleaned out her uncle's old apartment. From what she'd read, it seemed just the thing to address Boy Wonder's issues. But how could she get him to take it? You couldn't just walk up to someone and say, "Hey, I think you're psychotic and maybe it would be a good idea for you to take these meds." Besides, Boy Wonder clearly believed he was smarter than anyone else. He said so to anyone who would listen pretty much all the time. Ms. Lopez, the science teacher, would know what to do. After all, she had been a nurse. There had to be a way to do it. "That's a tough problem," said Ms. Lopez. "You're gonna have to give it to him every day. What does he do every day?" "We think he slips out to fast food places every day. He's always bringing back wrappers from Burger King and Popeye's. He acts like he doesn't know how they got there. But every day there are new ones." "That won't work," said Ms. Lopez. "We can't follow him to his favorite fast food joints every day. We have to work. What about cyanide? You'd only have to use that once." "We don't really want to kill him," answered Ms. Fitz. "Although I don't suppose anyone would miss him if we did." Ms. Fitz mused over that for a few moments. "Just a thought," said Ms. Lopez. "Does he ever eat or drink anything in the office?" "We think he eats the burgers while his blinds are pulled down." "Are you sure?" asked Ms. Lopez. "We're not," admitted Ms. Fitz. "No one wants to know what he does in there, because whatever it is, everyone thinks it's too gross to know about." "Okay," said Ms. Lopez. "What about drinks? What does he drink?" "He loves his Keurig machine. He is always drinking Dunkin Donuts coffee out of that World's Best Administrator cup. Can we pour something in the cup?" "No," answered Ms. Lopez. "You can't be around the cup enough. We're gonna have to find a way to inject the Thorazine into the K-cups. Every one of them. And when he gets new ones, we'll have to do those too. Can we get into his office when he isn't there?" "No one has a key. He doesn't trust anyone in there. No one is allowed to drink his Dunkin Donuts coffee except him and the principal, when she visits." "We're gonna have to find someone with a master key." said Ms. Lopez. "Maybe we can cut it with Xanax. A lot of teachers have Xanax." A lot of teachers have supervisors like Boy Wonder, thought Ms. Fitz. "When can we do this?" she asked. "We'll plan over the break and do it when we get back," answered Ms. Lopez. "Happy holidays." "I think we're gonna have a great New Year," said Ms. Fitz.